Following the completion of a two-year feasibility study, Mayor de Blasio has given the go-ahead for the proposed Brooklyn Queens Connector (BQX) streetcar project. 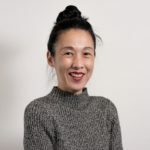 In April, Deputy Mayor Alicia Glen said that a “block-by-block analysis” by an outside consulting firm studying the project’s feasibility and financing would be completed soon. She noted if it was found that the streetcar ultimately would not pay for itself, the city would not proceed with the nearly $3 billion project. Mayor de Blasio announced plans for the BQX project in February 2016. The project would run along the developing Brooklyn-Queens waterfront, providing connectivity and “affordable, reliable, and accessible” public transportation to areas lacking mass transit. The streetcar would increase public transit options for neighborhoods with more than half a million residents and employees along the Brooklyn-Queens waterfront, including 40,000 NYCHA residents, according to a City Hall release. The project is also expected to connect mixed-income neighborhoods to jobs and transit hubs (9 ferry landings, 13 subway routes, and more than 30 bus lines), enhance economic development, provide resilient and sustainable transport, and support safer streets. First-year ridership is expected to be 50,000 commuters per day, the release states. 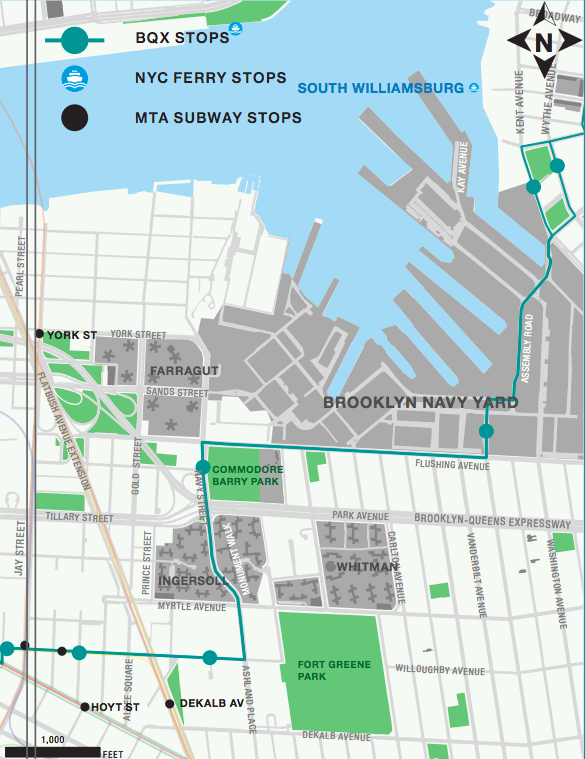 The revised, proposed 11-mile BQX route will connect Red Hook, Downtown Brooklyn, the Brooklyn Navy Yard, Williamsburg, Greenpoint, Long Island City, and Astoria. The originally proposed 16-mile route previously included the Brooklyn Army Terminal and Industry City in Sunset Park. The City decided to remove Sunset Park from the BQX route due to projected low ridership and the estimated high cost of construction (more than $500 million) in the neighborhood, according to the BQX August 2018 Completion of Conceptual Design Report, which states that a bridge would need to be built over the Gowanus Canal to accommodate the streetcar. The Council Member argues that the EDC has not provided a clear reason why the agency finds the BQX necessary, noting that private property owners and other major waterfront developments in North Brooklyn will benefit from the project while questioning whether the public will or if residents, business owners, and people “who had no need of the street car to begin with” will be displaced. 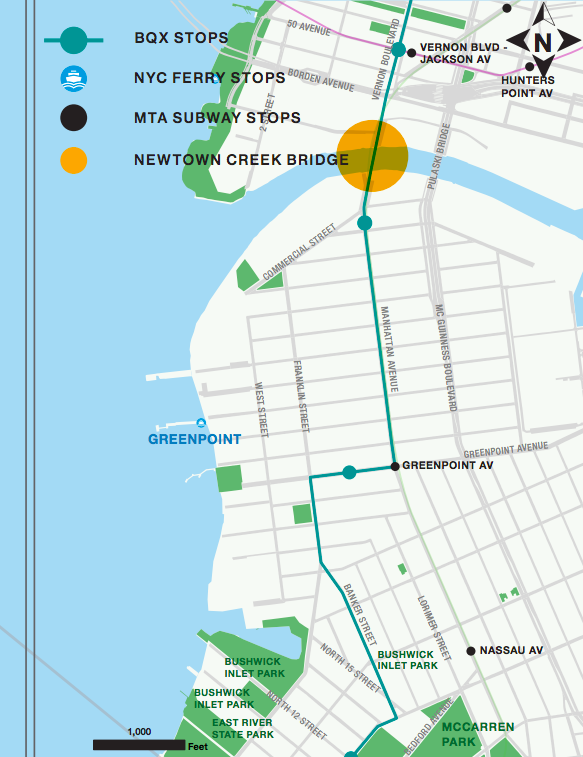 The revised route connecting Red Hook to Astoria was the “most beneficial route” analyzed, according to the report. This route is expected to generate the highest ridership, connect the greatest number of New Yorkers to jobs, amenities, and other transit options, and minimize disruptions to infrastructure and local businesses. According to the report, the BQX would be most heavily used by commuters in Downtown Brooklyn and Greenpoint. Most riders will use it to travel a few miles, with approximately 70% of riders taking the BQX to transfer to/from subways or buses to reach a final destination. 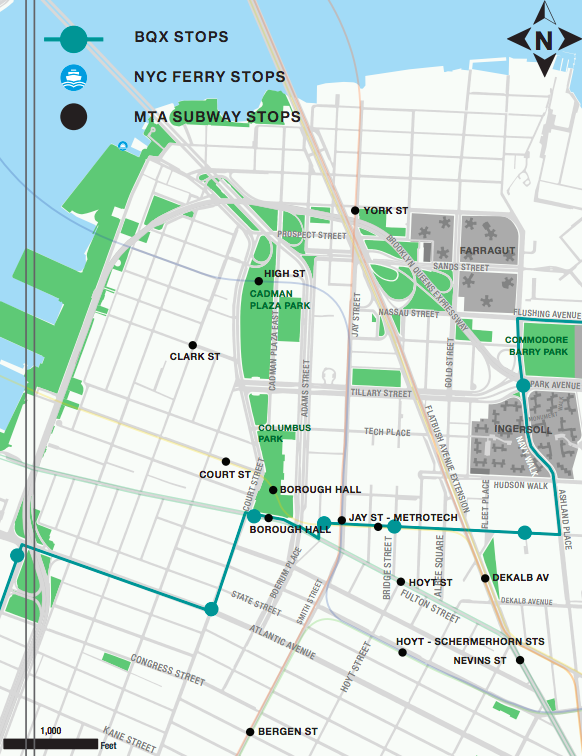 Red Hook/Columbia Street Waterfront District – The route would begin at Smith and 9th Streets and head west toward Columbia Street with connections at the Red Hook Recreation Center and the Red Hook Houses. The line would then head north on Columbia Street, through the Columbia Street Waterfront District, to Atlantic Avenue. Atlantic Avenue/Downtown Brooklyn – The “proposed alignment” will run from the Columbia Street Waterfront District along Atlantic Avenue to Court Street, north to Joralemon Street then east to Willoughby Street, linking to the 2/3 and 4/5 subway lines at the Borough Hall station. The line will then run to Ashland Place and over to Flushing Avenue creating a transit link between Downtown Brooklyn and the south west corner of Brooklyn Navy Yard. Brooklyn Navy Yard – The BQX will travel on Flushing Avenue, through the Brooklyn Navy Yard, to Kent and Division Avenues in South Williamsburg, providing a new transit link to NYCHA residents at Taylor Wythe Houses, Independence Houses, and Kent Village Housing. 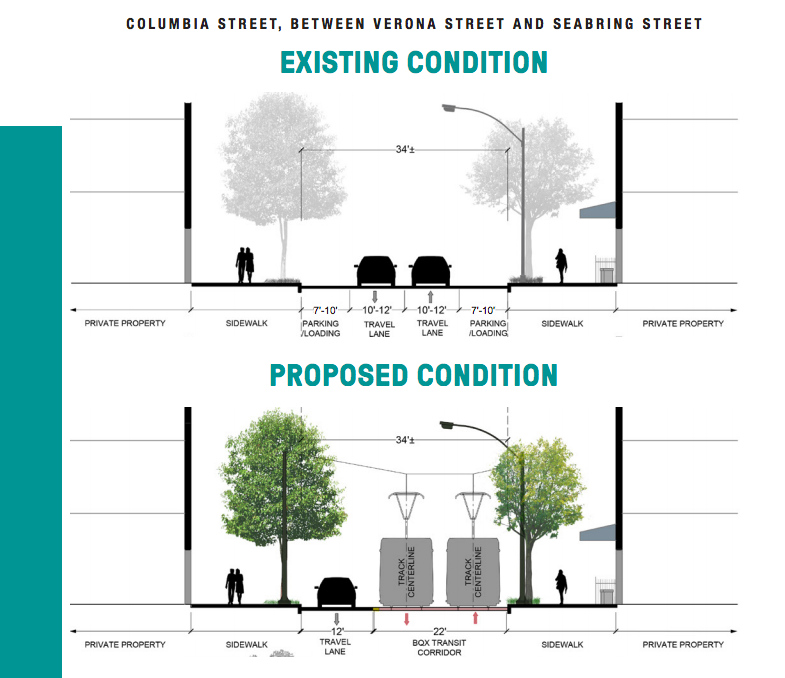 Williamsburg – The proposed route and design for the BQX in Williamsburg would travel along Berry Street between Division Avenue and Banker Street. 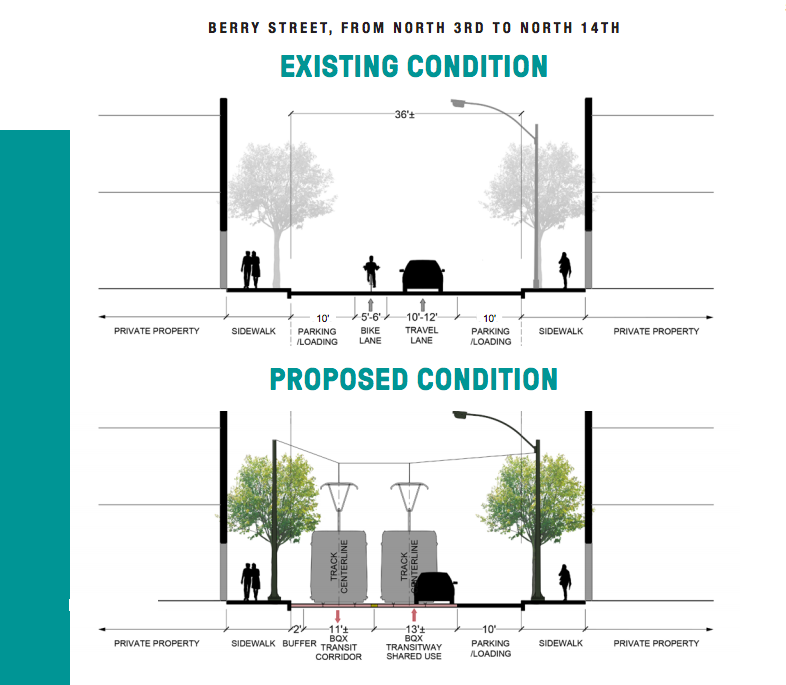 Berry Street will be transformed into a transit way, giving the BQX priority by prohibiting through traffic and limiting vehicular traffic to short trips (approximately 3 to 5 blocks) for resident pick-ups/drop-offs, some parking, and commercial deliveries. Greenpoint – The proposed BQX route through Greenpoint would run from Berry Street to Franklin Street along Banker Street, followed by a section along Franklin Street to Greenpoint Avenue. The route will then run on Manhattan Avenue to a proposed bridge, with an estimated cost of $241,000,000, over Newtown Creek that leads into Queens. The approximately 1,700-foot span needed to clear the LIRR railyard and Newtown Creek would include a drawbridge span over the waterway. Along with the streetcars, bicyclists and pedestrians will also be able to travel on the bridge. The BQX is projected to generate $30 billion in economic impact over 40 years including the creation of approximately 16,000 temporary construction jobs as well as approximately 4,000 permanent jobs. The construction and implementation of the BQX is estimated to cost $2.73 billion, and as Deputy Mayor Glen suggested in April, the City will seek federal funding for the streetcar project. The project’s cost was previously estimated at $2.5 billion. Along with an EDC website dedicated to the BQX to keep the pubic updated on the project, the City hosted seven Community Visioning sessions in mid-2016, which approximately 500 people attended, according to the report. The City promises that community stakeholders will be given additional opportunities to provide input as the project moves ahead to the environmental review and advanced design stages. The next steps in the BQX process include the City commissioning a design team to begin developing an Environmental Impact Study this winter. The ULURP process will follow in 2020. Construction is expected to begin on the BQX project in 2024 with an anticipated completion date in 2029. See the full BQX August 2018 Completion of Conceptual Design Report here. 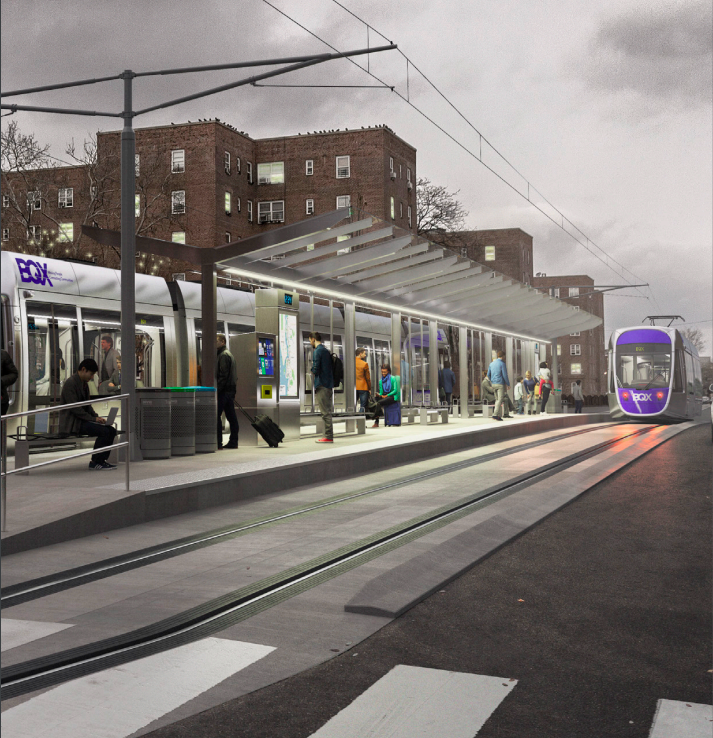 A couple of follow up questions: The renders of the tram show the elimination of the bike lane. Is this true? And has anyone addressed speed and how ecological these trams will be? Trams in Europe are nice, but extremely slow, and given our above ground track record (no pun intended) for train transportation, what’s the guarantee this will be a reliable and fast way to get around? Obviously the cost of another bridge over the Gowanus Canal tanked the budget. Trollies are too heavy with big trucks. What is this? Another G Train?